Home weddings are increasingly in favor with engaged couples all over the Puget Sound area. Getting married at home – or at a home of a friend or family member – is a marvelous way to create a casual and warm atmosphere, save money and have good control of your catering, venue/site and much more. So, what is your dream for your at-home wedding ceremony and celebration? – Where will your ceremony take place? As you picture yourself “walking down the aisle” or “walking down a staircase,” will there be enough room for your family and friends to comfortably watch and be a part of your wedding ceremony? 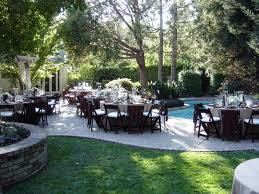 If the weather is good, does the home have a back yard area or garden for the wedding ceremony and/or reception? And if the weather isn’t good, does the home offer a “Plan B” in the event the ceremony or the ceremony and reception are both indoors? Don’t consider a home if people are going to be on top of one another. At some weddings I have been to, the lay-out of the home didn’t work for either the scope of the wedding ceremony not did it provide an easy and comfortable atmosphere for the wedding reception. – Consider all extra costs of a wedding at home. At a venue, details like linens, place settings, china, lighting, tables and chairs, banquet equipment, etc., are often all included in the price of your reception package. For a home wedding, it’s almost a sure thing that you’ll be calling a rental company to price out any and all items you will need to stage your wedding at a private residence. As you take a look at your rental budget, figure that you’ll probably spend about 20% more than you intend to as you finalize your rental items. It just seems to work like this time and time again for a wedding! – Cars, cars and more cars. Does the home offer convenient parking? If not, how will your guests park and will you possibly have a valet to assist with the welcoming of guests and parking of their vehicles? At some weddings I have attended, the host contracts with a shuttle service to ferry guests from the parking lot to the home. A wedding a few weeks ago provided several valet attendants who re-parked cars upon guest arrival. – The home kitchen – does it work for a party? Chances are you are either making your own food or hiring a catering company to cater the event for you. Either way, you’ll need plenty of kitchen space for food preparation, food storage and refrigeration space beyond what you think you’ll need. I know one bride who rented two refrigerators and placed them in her garage where she stockpiled desserts and beverages for her party. – Clean-up and good-bye. Small weddings are a cinch – minimal clean-up and you’re done. Larger weddings are more complicated. As you plan the entire day, insure you take good care of your hosts by either hiring a cleaning crew to leave the space spotless or enlist the help of family and friends to stay late to insure the home is left in best condition. Other: Depending on the size of your wedding, consider the number of bathrooms available for guests. Your host may want to take pets to a neighbor’s home for the day so a dog or cat isn’t stressed by such an event. And finally, talk to your host about liability insurance and homeowners insurance. To be smart, have them review the policy in the event someone gets injured or takes a fall on your wedding day.